Hi there! I hope you had a great weekend! 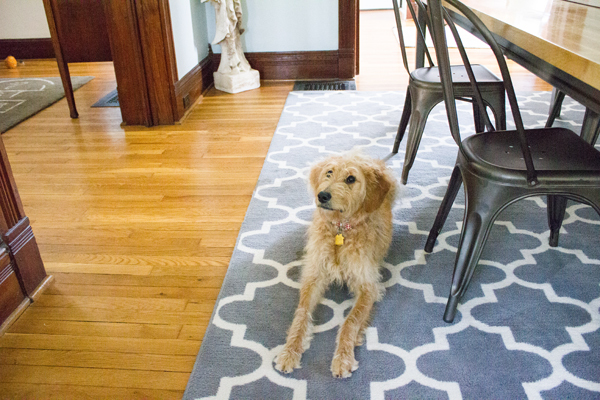 After being “interrupted” by all this baby talk, we haven’t finished our home tour yet, so here’s the next room in this totally-in-no-order-at-all tour — the dining room. This room has had an interesting — and sort of embarrassing! — evolution. It’s the front room, to the right of the front door off the entryway, and is dominated by a large black marble fireplace with its original coal-burning stove! (We’ve never used the stove, but the former owners said that it still works.) When we first moved in, we used this area as a formal living room. 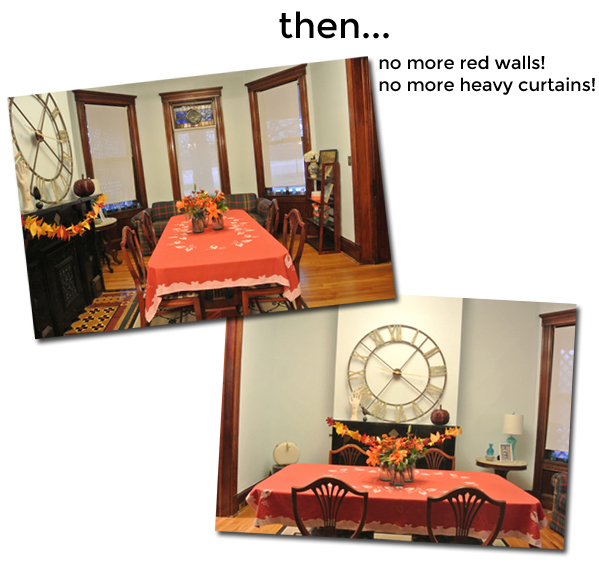 We painted the walls a reeeaally bright red, that for some reason seemed like a good idea at the time (yikes), and filled it with a lot of turn-of-the-century furniture that originally belonged to my great grandfather. It seemed appropriate to the era of the home … or an opium den … or maybe a brothel. We lived with it like this for a couple of years but it was NOT us. Not at all us. 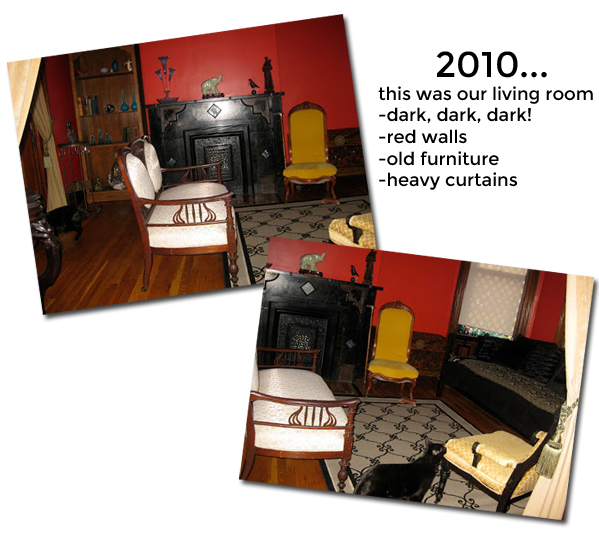 One day in 2013 we decided to see what it would be like to switch the living room and dining room, so the dining table moved in here and most of that old-fashioned furniture moved to the attic. We also took down the heavy gold velvet curtains that had been in the doorways when we moved in, which visually opened up the whole first floor and makes this room feel more connected to the rooms around it. Then we finally said goodbye to the bright red opium den walls and repainted the room a nice pale blue that sometimes reads a little grey and sometimes a little green depending on the light. It’s a hard color to get right in photos. 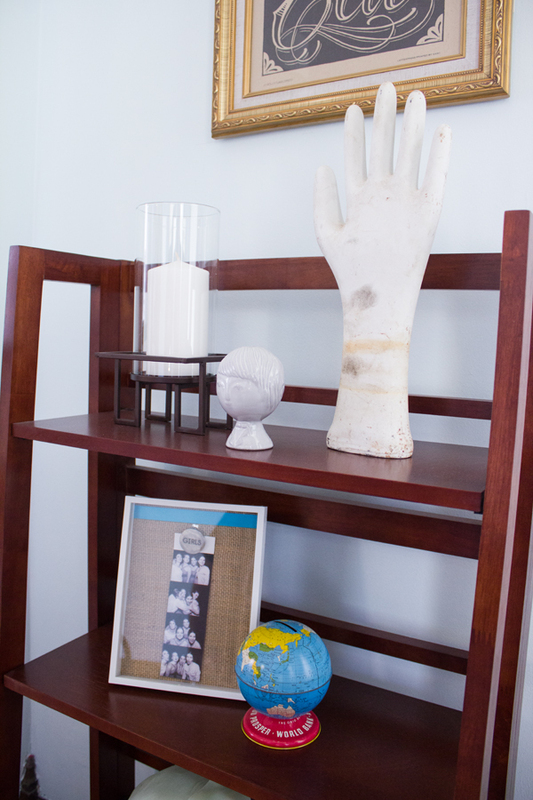 The new paint was a HUGE transformation and instantly brought the room into the 21st century. 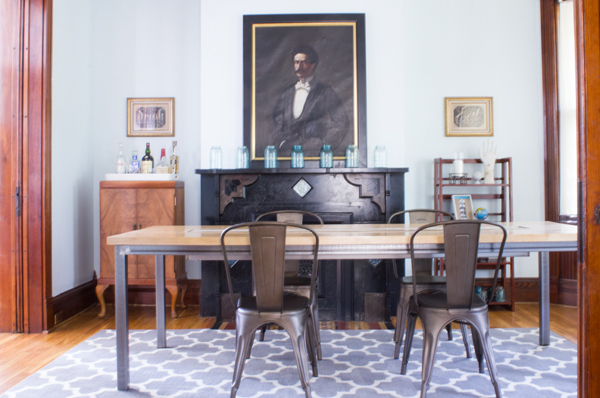 We had a new wood-and-metal table custom built by a super talented local furniture maker, Play-haus Design, and paired it with some industrial-inspired chairs and a big grey rug. 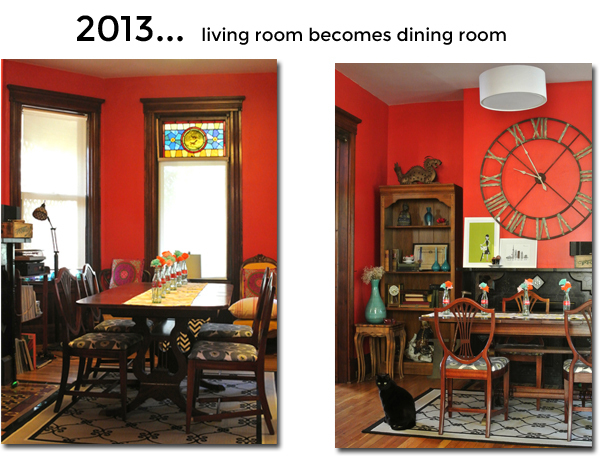 Now the dining room feels light, bright, modern and sooo much more like us. 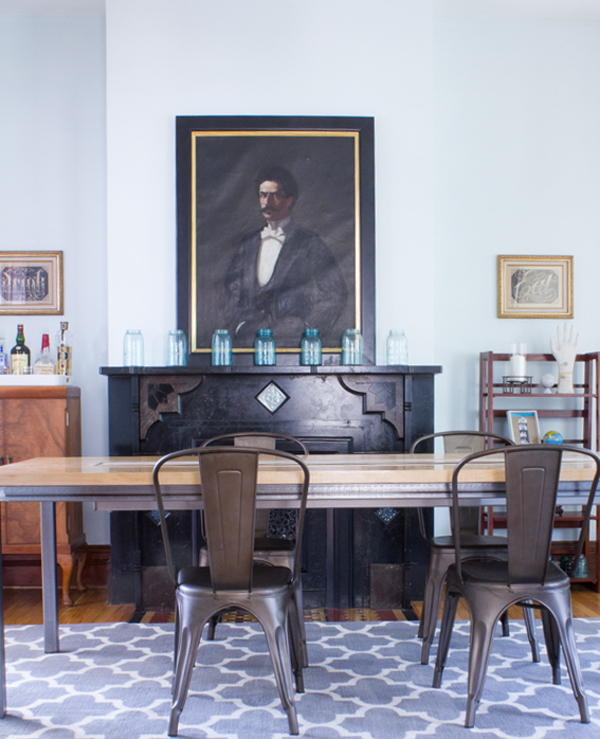 The dining table is one of our favorite things ever. The middle pops out and has a metal trough to hold ice, so the table becomes a bar! 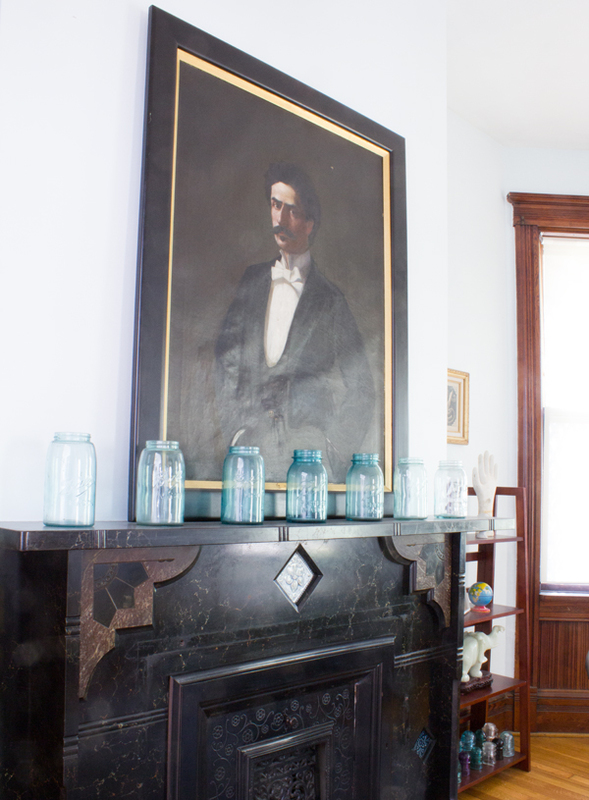 My great-grandfather’s portrait is perfect above the fireplace with my collection of vintage blue mason jars. I love the mint and teal tile insets in the black fireplace, which look great with the wall color. Drink! 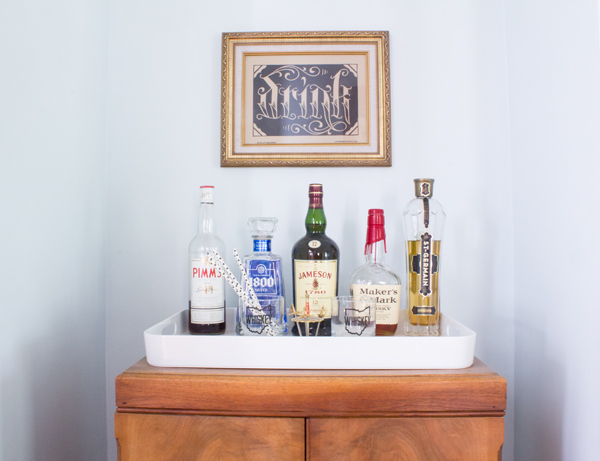 The bar was my great-grandfather’s and I love it (we once wrote a whole post about it if you want to see more pictures, HERE) . The letterpress print is by Roll & Tumble Press. There’s another that says “Eat” on the opposite side of the fireplace. This statue that I named Lilly was in my grandma’s house. It’s supposed to be a lawn ornament, but I think it’s so funny that she had it in her house that I like to keep it in my house, too! 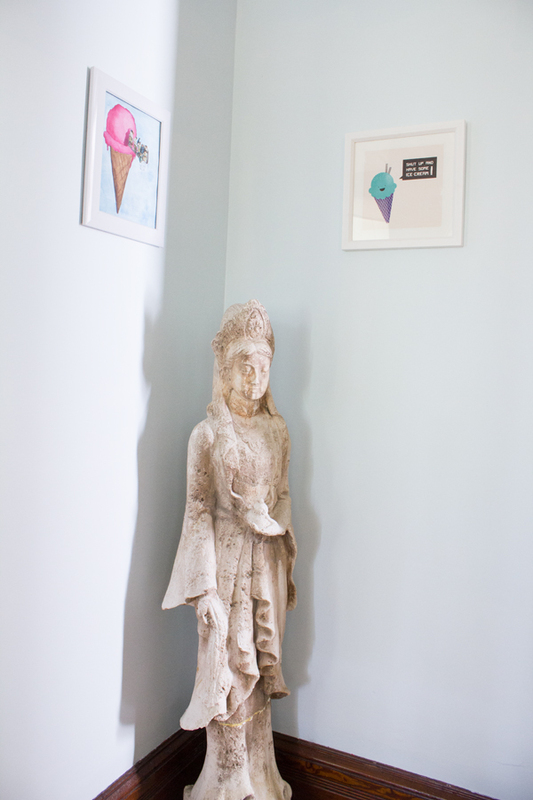 Above Lilly is our little collection of ice cream-themed art. The one on the left is by our good friend and talented mixed-media artist, Stephanie Rybicki, and the one on the right came from Society 6 (I can’t find the artist’s name). So that’s our dining room! We eat every meal together in here, which I love. It’s so great to sit at the table and watch everyone playing at the park across the street. Ruby loves it, too!